A Luscious Body Cream Enhanced with Olive Oil and Olive Butter for a Truly Skin Soothing Experience! 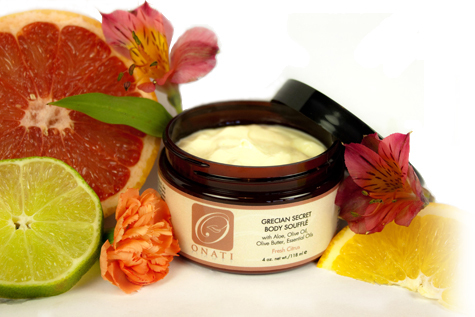 This luxurious body and / or face cream is perfect for all skin types including mature, sensitive and very dry skin. Skin affected by psoriasis, eczema and rosacea will benefit from this gentle, lightly whipped skin nourishing cream without irritation. It is rich in antioxidants and polyphenols which combat the signs of aging caused by free radicals and the suns harmful rays. Drench your skin with intensive moisture hydration of Olive Oil and Olive Butter which also act as natural humectants. This multi-use skin cream is ideal for keeping skin soft and smooth throughout the day and night and is fantastic for head to toe skincare. Use as a massage cream, lip balm, under eye cream, on brittle nails or nighttime facial treatment. Oily Skin will also benefit from Olive oil when using it for moisturizing. Applying Olive oil on oily skin sounds contradictory, however, by applying this penetrating oil to the skin it can help avoid the issues such as blemishes, blackheads, cysts and acne since it is excellent for balancing skins pH and softening hardened sebum which can clog the pores of the face. Olive oil will help to balance and manage the natural oil production of skin, and will beautify the face and body, leaving skin soft and supple.